Responsible of International and European collaborations team at CC-IN2P3/CNRS. Responsible of International and European collaborations team at CC-IN2P3/CNRS.After her doctorat ès sciences in physics at Paris XI University in France and fellowships at CERN, she has participated into the commissioning of the D0 experiment at Fermilab with University of Stony Brook (USA) and joined later ETH Zürich (Switzerland) and CERN as research physicist. She participated in the L3 experiment at LEP where her interests where on heavy flavours, B and Tau lifetimes, B tagging for Higgs discovery. She has lead analysis teams and has been responsible on the TEC central detector and its pattern recognition software. 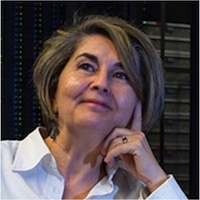 At LHC she has participated into the ATLAS experiment at LHC, working on the distributed computing.Since 2007 she is at CC-IN2P3 and has lead the support group shaping the dedicated support to LHC experiments and participating into the ATLAS experiment. She is scientific team leader for some national or European projects such as BIOASTER, eTRIKS and recently XDC project and participates into collaborations with Japan and China.